A perfect accompaniment to your curries, full of flavour and really simple. 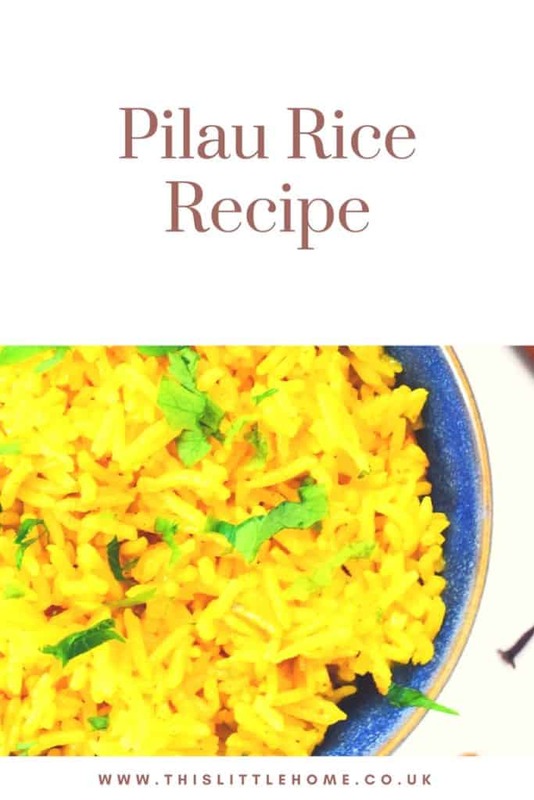 This Pilau Rice is a must for a curry night! I am competing this weekend with my giant, Bruce. Cue me trying to learn a dressage test by prancing around my living room every spare moment I get. I swear, my neighbours must wonder what goes on in our house! Maybe I should be closing the curtains more often….? This will be the last competition for me in 2015…. Where did the year go?? Yes, I am one of those people who is always saying “oh wow is it that date already?! ?” and “where has the week gone?” I thank a chronic lack of sleep for the last few years for that! So, when I mostly can’t even tell you what day it is, you can imagine just how hard it is for me to keep the dressage test in my head! But I have to try and at the same time, I might as well be providing a little light entertainment for the neighbourhood as they watch me doing my strange horse dance around the house! I made a curry this week as you know, but if you didn’t, check out the recipe here. You have to have rice with a curry, right? But why settle for plain, boring old boiled rice. 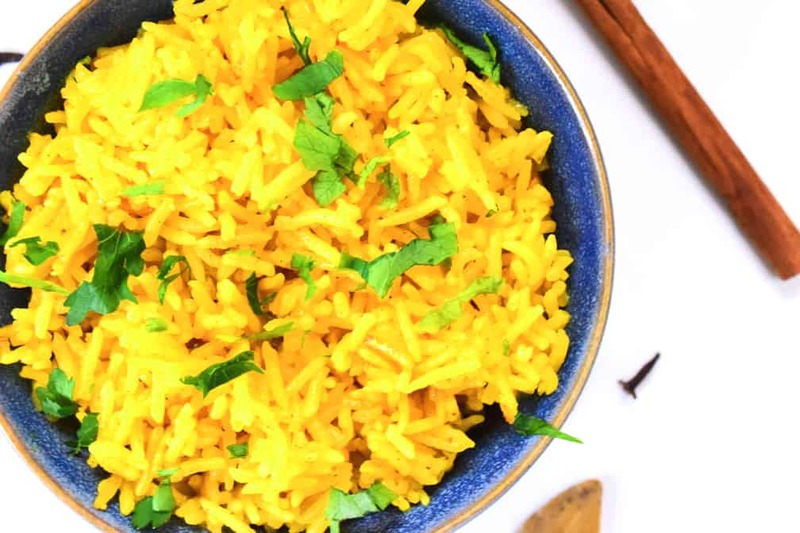 Rice doesn’t need to be boring, it’s simply begging for extra flavour and you literally have so many options! Here is the perfect partner to my “fakeout” Korma curry (that’s when I pretend I’ve ordered in but have actually cooked it at home!). Slightly spicy and oh, so, yellow, It’s like eating a big bowl of the sun, which has been missing for what feels like a lifetime now! This is guaranteed to brighten up your plate whatever you choose to serve it with. I used to struggle massively when cooking rice. It would always come out either stodgy, undercooked or burnt! No matter how much I rinsed it, stirred it, measured it and even prayed for it! Nothing worked. So, I’m glad to say this rice is pretty fool proof too! 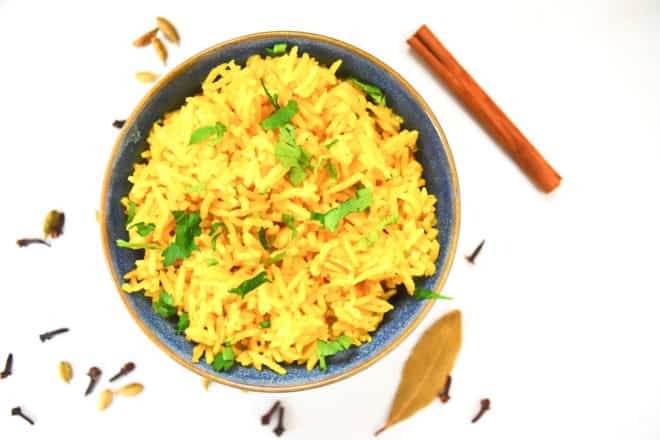 If, like me, rice seems to have a vendetta against you, try this recipe. 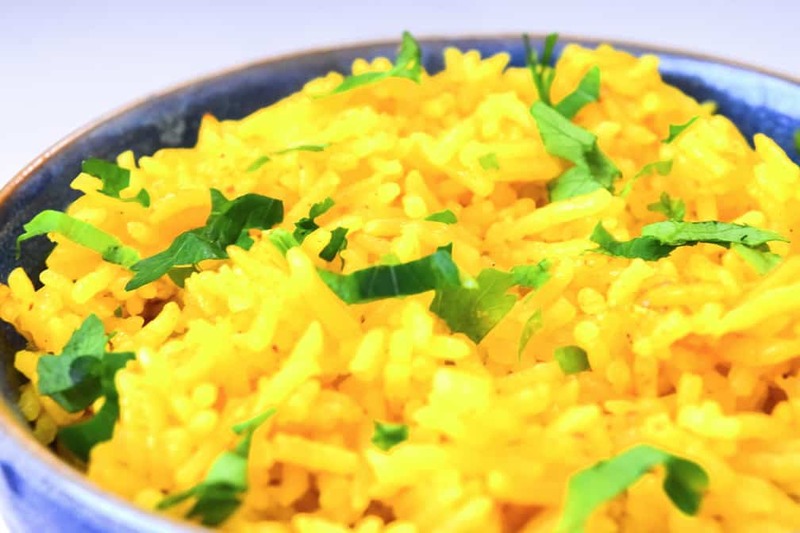 You’ll be amazed at how easy and how tasty rice can be! Place your rice in a bowl and cover with warm water, leave to soak for 10 minutes and then rinse until the water runs clear, drain and leave to one side. Add the spices and cook until aromatic. Add the rice and stir to disperse the spices throughout. Place a tight fitting lid on the pan and simmer over a gentle heat for 5 minutes. Turn off the heat and leave for 10 minutes with the lid on. .